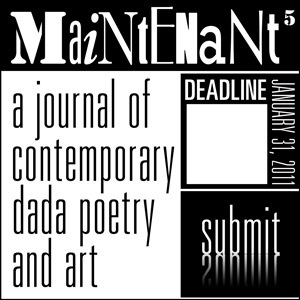 Be a part of the 4th annual New York DaDa Poetry Salon, by submitting your DaDa-inspired poetry and/or art to Maintenant5, A Journal of Contemporary Dada Poetry & Art. The concept of Maintenant is inspired by DaDa instigator and Three Rooms Press spiritual advisor Arthur Cravan. In the past three annual issues, we received increasingly bolder work from Neo-Dadaists worldwide. We’re excited about this year’s new perfect bound format, and we’re looking for the best Neo-Dada work ever to publish. Poems should be no longer than 20 lines. Do not send multi-page poems as they will not fit our format and will be rejected outright. But DO submit your shorter work—as long as it is full of the intensity and madness that reflects the age we’re living in.. Also–we LOVE Dada-inspired word art, collage and photography. All art must be submitted in jpeg format, high resolution (300 dpi, 4×5 in). Black & White only. The journal will be distributed at the DaDa Poetry Salon on Friday, March 18th, 2010 at Cornelia Street Cafe (29 Cornelia Street, NYC, 6-8 p.m.), via mail to contributors, and to those wise enough to request a copy. *Arthur Cravan is credited with creating the first ‘zine in the world with his publication Maintenant. We’re proud to carry on the tradition.